We interrupt this blog for BASEBALL! I love baseball. I've loved it since I was a little girl and Johnny Bench was a catcher. I love the sounds of it, the crack of the bat, the cheer of the crowd. The next two days are two of the best days of the year for me and my oldest son. We'll be watching Home Run Derby and the All-Star Game. Not only will these two events be played in my team's stadium but my favorite player will be playing in the All-Star game. I am proud to be a Barry Bond's fan! One of my all-time best gifts was the Giants versus Pirates game my oldest son took me to for Mother's Day last year. We both share a love of baseball. We are fans of teams who never seem to win the pennant race, but, we keep dreaming! My son is a Pirate's fan. Barry Bonds started out with the Pirates and my son stuck with them even after Barry left. 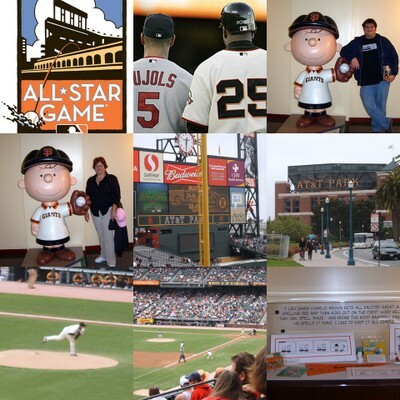 I've been a Giant's fan as long as I can remember. I've spent many nights watching baseball with my son. We root and holler, turn our hats inside out and act like complete nuts. You can probably hear us in the next county. Somebody pass the hot dogs. I've got dibs on the prize in the Cracker Jack!